Located four miles south of the Town of Jackson, this 890 acre phased development consists of two distinct areas, the Upper Melody Ranch and the Lower Melody Ranch. The Upper Melody Ranch is a clustered residential development containing a mix of market, attainable, and affordable housing units with surrounding pods of recreational and agricultural open space. The Lower Melody Ranch, is approved for 70 market residential lots averaging one acre in size; 330 acres have been preserved as agricultural – ranch lands. Jorgensen Associates has provided civil and structural engineering, land use planning, and land surveying services for the development and continues to maintain and operate the Melody Ranch water supply and distribution, and wastewater collection systems. Civil engineering responsibilities include project management, design, permitting, and entitlements, from concept phase of the project through final construction and construction administration. Design elements include all infrastructure including roads and pathways; cable and gas utilities; and systems for water supply and distribution, wastewater collection, pumping and conveyance, and storm water management. The work included extensive environmental analyses including groundwater monitoring, wetlands delineations, and flood plain investigations. 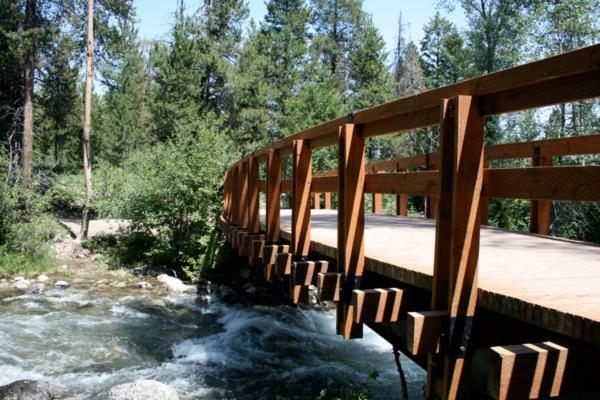 Additionally, Jorgensen Associates provided the structural design of a 36 foot wide timber bridge over Flat Creek, connecting the eastern portion to the western portion of the Upper Melody Ranch development. Land surveying services included boundary determination, topographic, right-of-way, and construction surveys.